That day and the two following they neither discovered land nor anything new; for they had formerly sailed that way: but on the fourth they made an island called Medamothy, of a fine and delightful prospect, by reason of the vast number of lighthouses and high marble towers in its circuit, which is not less than that of Canada (sic). Pantagruel, inquiring who governed there, heard that it was King Philophanes, absent at that time upon account of the marriage of his brother Philotheamon with the infanta of the kingdom of Engys. Hearing this, he went ashore in the harbour, and while every ship’s crew watered, passed his time in viewing divers pictures, pieces of tapestry, animals, fishes, birds, and other exotic and foreign merchandises, which were along the walks of the mole and in the markets of the port. For it was the third day of the great and famous fair of the place, to which the chief merchants of Africa and Asia resorted. Out of these Friar John bought him two rare pictures; in one of which the face of a man that brings in an appeal was drawn to the life; and in the other a servant that wants a master, with every needful particular, action, countenance, look, gait, feature, and deportment, being an original by Master Charles Charmois, principal painter to King Megistus; and he paid for them in the court fashion, with conge and grimace. Panurge bought a large picture, copied and done from the needle-work formerly wrought by Philomela, showing to her sister Progne how her brother-in-law Tereus had by force handselled her copyhold, and then cut out her tongue that she might not (as women will) tell tales. I vow and swear by the handle of my paper lantern that it was a gallant, a mirific, nay, a most admirable piece. Nor do you think, I pray you, that in it was the picture of a man playing the beast with two backs with a female; this had been too silly and gross: no, no; it was another-guise thing, and much plainer. You may, if you please, see it at Theleme, on the left hand as you go into the high gallery. Epistemon bought another, wherein were painted to the life the ideas of Plato and the atoms of Epicurus. Rhizotome purchased another, wherein Echo was drawn to the life. Pantagruel caused to be bought, by Gymnast, the life and deeds of Achilles, in seventy-eight pieces of tapestry, four fathom long, and three fathom broad, all of Phrygian silk, embossed with gold and silver; the work beginning at the nuptials of Peleus and Thetis, continuing to the birth of Achilles; his youth, described by Statius Papinius; his warlike achievements, celebrated by Homer; his death and obsequies, written by Ovid and Quintus Calaber; and ending at the appearance of his ghost, and Polyxena’s sacrifice, rehearsed by Euripides. Book 4. Chapter II. 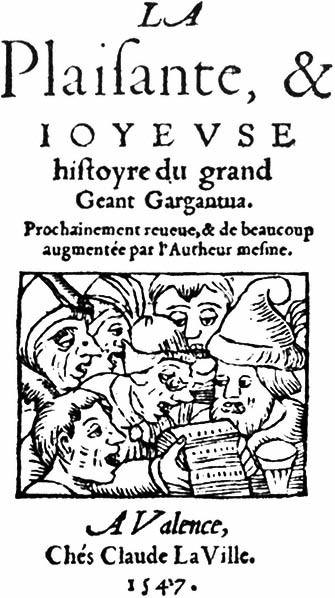 How Pantagruel bought many rarities in the island of Medamothy.